Brief Description of Subject: Jesus sits on a rock with his arms around 2 children, with 2 other children next to him. 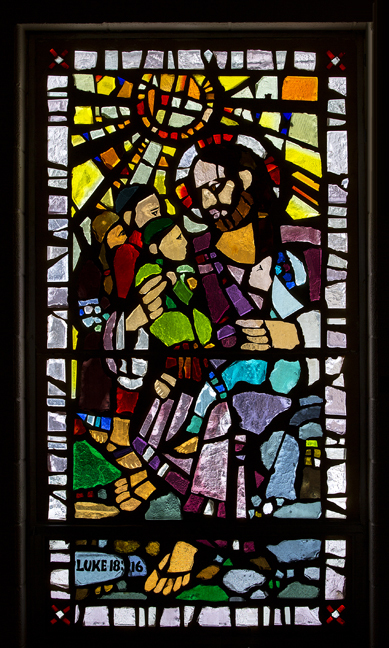 This window, located in the narthex at the head of the staircase, was not a part of the original plan, but as the theme of the Life of Christ unfolded, the decision was made in November 1976 to include this one. It was to be a Sunday School project and the children were to raise part of the money to pay for it. In September 1977, Peg Race offered to pay for the window, and her offer was graciously accepted. The funds which had accumulated to pay for this window were put toward the cost of the large window over the front doors. Even though this window was not a part of the original plan, it certainly fits very comfortable into the theme of the Life of Christ presented in the windows. It is a little difficult to imagine the series without it, since Jesus blessing the children is so much a part of our concept of the life and ministry of Jesus. As with the other windows, this is a contemporary rendering of a classic subject: Jesus with the children. It shows Jesus wearing a robe in shades of purple seated on a rock with the classic nimbus (halo) around his head. Two children, a boy dressed in green robe and yarmulke and a girl dressed in a blue robe and head covering, sit on his lap with his arms encircling them. Very, very close to these two children and very, very close to Jesus stand two other children: a girl in a deep brownish-purple robe and a boy in a red robe. Behind and above and illuminating this scene is a sunburst in shades of yellow, gold and orange. This window especially shows the unusual and beautiful qualities of the facet glass technique as opposed to the traditional leaded glass as well as the skill of the artist in the use of shaded pieces of glass. The thickness of the glass and the shapes of the pieces are used very skillfully to shape and shade the figures of Christ and the children and the sunburst. The artist’s skill is evident in the detail of the figures of Christ and of the children, and particularly in the detail in the face and the eye of Jesus as he looks at the children. The colors and the detail work show to great advantage the special qualities of the glass. There are some unusual and vivid colors used in this window: the grays in the rock, the shades of purple in Jesus’ robe, the red robe and the yarmulke of the standing boy, the shades of yellow in the sunburst, the deep purple (almost brown) in the robe of the standing girl, the deep brown of Jesus’ hair. Some of them are used in other windows in the sanctuary, but they are especially noticeable in this one, perhaps because of the combination of colors used. Artists Richard Hanley and Mark Taleba. Installation by Omnibus Studios, Okemos, MI.